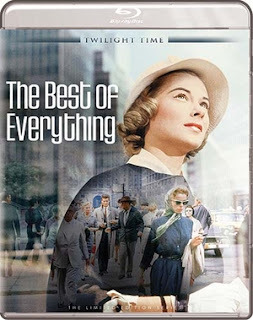 Plot: Product Description: A fabulously juicy melodrama based on Rona Jaffe’s spicy novel about working girls at a 1950s-era New York publishing house, The Best of Everything (1959) is brought to the screen by that painterly master of ’Scope, director Jean Negulesco. Starring Hope Lange, Diane Baker and Suzy Parker as a trio of roomies working under an “exacting” female boss (the one and only Joan Crawford), the film details their trials and tribulations, both professional and very personal. This is a wonderful movie. A truly memorable romantic drama. A great story laced with a dose of drama that is executed through a wonderful cast of actors and actresses. This is the first time that I have seen this film. This one was another film that seemed to go unwatched by me. Twilight Time did another fantastic job releasing this on a beautiful Blu-Ray. I highly recommend it. Seeing it for the first time on this top quality product makes the experience all the more perfect. This was adapted into a screenplay from the 1958 book written by Rona Jaffe. The novel is titled the same. Jaffe is a brilliant storyteller. I have always loved her very descriptive nature throughout her books. She is most remembered from her controversial, 1981 book, Monsters and Mazes where she tackled the reality of Real life Role playing, which could lead to a darker side, where the fictional world and the non-fictional world collide. This was based on half-truths, talking about an individual that transcended into the tunnels in his role playing reality, and being lost, but in reality in real life it was an individual named, James Dallas Egbert the 3rd. He had entered the tunnels to kill himself. But this was the 80s during a time when the role playing game Dungeons and Dragons and the Satanic panic of the 80s played around with the subject matter. The book ultimately became a movie starring a very young 26-year-old Tom Hanks. Jaffe was a stunning writer that left the world with many wonderful pieces of storytelling. The Best of Everything is one of those stories made into this wonderful drama. Directed by Jean Negulesco. Jean is a brilliant filmmaker. He had away with truly making a film stand out. He directed many pieces of wonderful cinema, and had a very unique eye at making cinema passionate. One of those pieces of film is, The Best of Everything. Interesting to note is this story was also adapted into a Soap Opera, and also a Stage Play. Starring in a very small part, one of my favorite actresses of all time the extraordinary and brilliantly talented Joan Crawford. She is in it only a short time, but still great to see. This film has an ensemble cast of total acting brilliance. The beautiful and amazing Hope Lange as your main character Caroline Bender. Bender’s character is as a young secretary who has been let down, and that jilted reality leads her into the arms of her editor. The editor is played by the equally talented Stephen Boyd playing the character Mike Rice. Starring also the talented and striking Suzy Parker as the character Gregg Adams. Martha Hyer as character Barbara Lamont, Diane Baker as April Morrison, Braine Aheme as Fred Shilimar, Robert Evans as Dexter Key, and many wonderful others. Each one added a dynamic experience on screen that the viewer can’t help but be entertained by. In reality, the film had many problems getting made. A lot of the original cast was replaced, or actors and actresses that was supposed to play the part, was changed, or dropped out. This also included the directors, and production problems. Thankfully the film finally got underway and created a wonderful little piece of cinema that Twilight Time has honored with an amazing Blu-ray. Having never seen this before, all I can say is this product is perfection, in visual, and sound quality. A beautiful vibrant film. A sound that is crystal clear to the ears. A total perfection in this department. Isolated Score Track. Here is another dynamic special feature. The music is composed and conducted by the wonderful and amazing Alfred Newman. Alfred Newman alongside the orchestra of Earle Hagen and Herbert Spencer create a wonderful example of music perfection. There is also the mix throughout the film by Cyril Mockridge, Lionel Newman, Johnny Mercer, all multi-talented music Gods that leave a truly lasting impression upon the watcher of this fun romantic drama. Audio Commentary with Author Rona Jaffe and Film Historian Sylvia Stoddard. This is a wonderful special feature. I was thoroughly educated on this piece of film. I really thought this was a perfect commentary to a film that should be seen and experienced. You also as always get the wonderful booklet insert by the amazing film historian Julie Kirgo. This booklet is always highly praised by me. I love when lovers of cinema explore, and educate, and express the beauty of film. Another wonderful and flawless example of how to treat a piece of cinema. A fresh, beautiful new outlet. A top quality Blu-ray in showing how to treat a piece of cinema history. Twilight Time aced it again and brought out a great product. A wonderful, fun, romantic drama that is the classic reality in making film.